XOANON PUBLISHING was founded in 1992 e.v. to serve as the sole publisher of the Cultus Sabbati. Cultus Sabbati is a closed circle of British and American traditional cunning-craft initiates. It is the founding body of the contemporary recension of lore and praxis known as the Sabbatic Craft Tradition and is the point of origin for the Teachings of Crooked Path Sorcery. For those wishing a basic introduction to the subject of the Sabbatic Craft, we have appended a brief article entitled ‘Cultus Sabbati: Provenance, Dream, and Magistry’. We politely invite those seeking deeper understanding to read and study within the scope of our publications. The aim of Xoanon is literally its own name: the embodiment of divinity fallen from the sky. This arcanum is interpreted in our Work as the manifestation of magical books from the sidereal ‘heaven’ of initiatic consciousness. 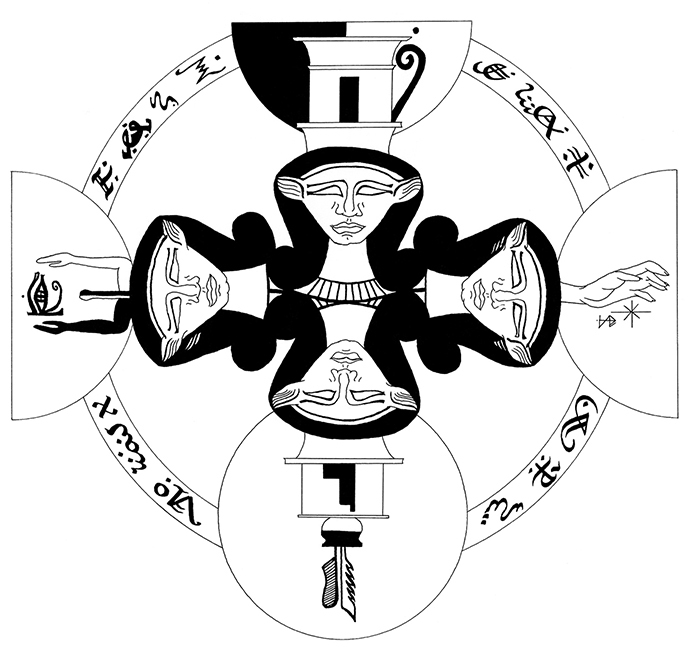 Our Work thus intends the reification of living magical eidola: the incarnation of visionary and dream-begotten grimoires, the talismanic embodiment of spirits in text and image, and the transmission of lore from mind unto mind. To the ancients, ‘xoanon’ was the image, or earthly refraction, of a deific form, but also Earth-Made-Holy, for xoana were also the sacred mommets given as votive offerings unto the nymphs and spirits of place. This meaning too is apposite our endeavour, for the books which flow from the fountain of the Dreaming Sabbat serve as the oblations unto the patron luminaries of our Arte. The sky-fallen stone Xoanon is thus a worldly mirror of the spirits themselves, their ever-shifting faces assuming new masques as they are beheld anew upon each page. We request that our readership consider the intent of Xoanon’s work and thereby remain sensitive to the understanding that our books are borne from a living initiatory tradition. The outer issue of text and image is the casting of a far-flung circle of spiritous communion, whereby that which remains within is warded by cipher and veil, and yet that which lies outside is offered as a gift for inspiration and a means of private attainment. It is our hope that individual aspirants will employ our works respectfully and in the realisation that their possession is a matter of interaction between Daemon and Man.